War in Afghanistan : Hell in a Beautiful Place: Global News Portfolio: New Orleans based Photojournalist covering the Deep South and beyond. 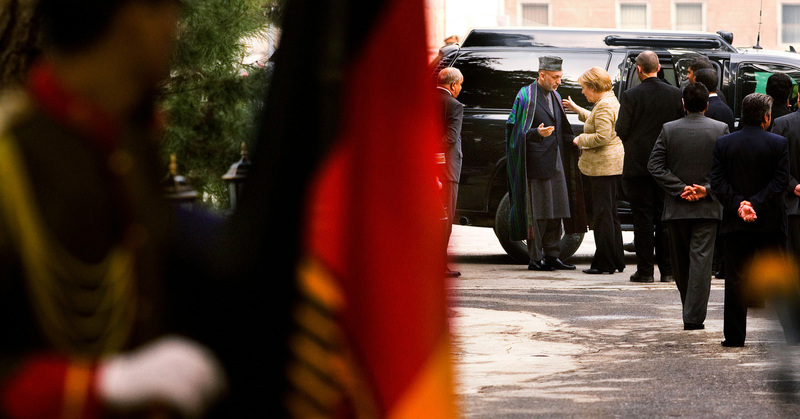 German Chancellor Angela Merkel speaks with Afghan President Hamid Karzai as they arrive for a joint press conference at the palace in Kabul, Afghanistan on Saturday November 3, 2007. The German chancellor talked about the progress made in building schools for girls and her desire to strengthen her relationship with Afghanistan. The chancellor also visited Germany’s 3,000 troops who are part of the NATO-led International Security Assistance Force. Germany has been criticized recently for keeping troops on relatively peaceful missions in the north of the country and not engaging in the antI-Taliban insurgency in the south of the country.